Seagal, along with Maricopa County Sheriff Joe Arpaio, has been served with an official notice of claim from Jesus Sanchez Llovera — who contends Seagal and the Maricopa County Sheriff's Department performed an "unfounded" raid on his home because they believed Jesus was operating an illegal cockfighting farm. Jesus denies the allegation — insisting he only raises the roosters "for show." Jesus claims Seagal arrived to his home on March 9 with a TANK — and rammed into a gate on his property. Seagal was backed up by an MCSO Tactical Operations Unit — armed in full riot gear — which stormed the house. 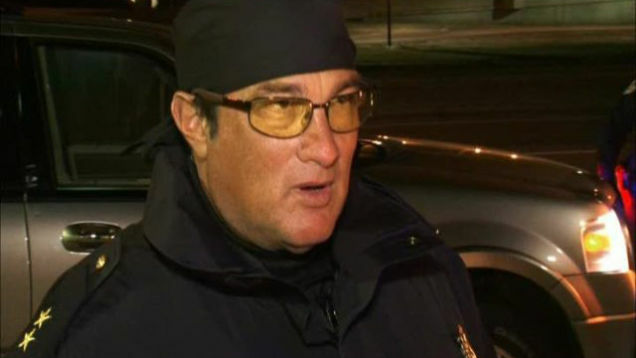 The entire incident was captured by a camera crew taping for Seagal's reality show, "Steven Seagal Lawman." But, as The AV Club points out, Seagal considers animal cruelty "one of [his] pet peeves"! So why not just have him investigate the incident? It would make about as much sense as anything else in Arizona.